Godalming /ˈɡɒdəlmɪŋ/ is a historic market town, civil parish and administrative centre of the Borough of Waverley in Surrey, England, 4 miles (6 kilometres) SSW of Guildford. The town traverses the banks of the River Wey in the Greensand Ridge – a hilly, heavily wooded part of the outer London commuter belt and Green Belt. In 1881, it became the first place in the world to have a public electricity supply and electric street lighting. Godalming is 30.5 mi (49.1 km) southwest of London and shares a three-way twinning arrangement with the towns of Joigny in France and Mayen in Germany. Friendship links are in place with the US state of Georgia and with Moscow. James Oglethorpe of Godalming was the founder of the colony of Georgia. Godalming is regarded as an expensive residential town, partly due to its visual appeal, favourable transport links and high proportion of private housing. In 2006 it was ranked the UK's third most desirable property hotspot, and in 2007 it was voted the fourth best area of the UK in which to live. The borough of Waverley, which includes Godalming, was judged in 2013 to have the highest quality of life in Great Britain, and in 2016 to be the most prosperous place in the UK. The town has existed since Saxon times (see also Godalming (hundred)), and probably earlier. It is mentioned in the will of King Alfred the Great in 899 (where it and Guildford are gifted to Alfred's nephew, Æthelwold) and the name itself has Saxon origins, 'Godhelms Ingus' roughly translated as "the family of Godhelm", and probably referring to one of the first lords of the manor. Godalming grew in size because its location is roughly halfway between Portsmouth and London, which encouraged traders to set up stalls and inns for travellers to buy from and rest in. Godalming Parish Church has an early Saxon chancel and a Norman tower. Godalming appears in Domesday Book of 1086 as Godelminge. It was held by William the Conqueror. Its domesday assets were: 2 churches (both held by Ranulf Flambard) worth 12s, 3 mills worth £2 1s 8d, 25 ploughs, 40 acres (16 hectares) of meadow, woodland worth 103 hogs. It rendered £34. Its population was roughly 400 people. At the time, its manor belonged to the King, but a few hundred years later, ownership transferred to the Bishop of Salisbury, under a charter granted by King Edward I of England. In the year 1300, the town was granted the right to hold a weekly market and an annual fair. Its major industry at the time was woollen cloth, which contributed to Godalming’s prosperity over the next few centuries, until a sudden decline in the 17th century. Instead, its people applied their skills to the latest knitting and weaving technology and began producing stockings in a variety of materials, and later to leatherwork. A willingness to adapt from one industry to another meant that Godalming continued to thrive. For example, papermaking was adopted in the 17th century, and paper was still manufactured there in the 20th century. The quarrying of Bargate stone also provided an important source of income, as did passing trade - Godalming was a popular stopping point for stagecoaches and the Mail coach between Portsmouth and London. In 1764, trade received an additional boost when early canalisation of the river took place, linking the town to Guildford, and from there to the River Thames and London on the Wey and Godalming Navigations. In 1726 a Godalming maidservant called Mary Toft hoaxed the town into believing that she had given birth to rabbits. The foremost doctors of the day came to witness the freak event and for a brief time the story caused a national sensation. Eventually Toft was found out after a porter was caught smuggling a dead rabbit into her chamber, she confessed to inserting at least 16 rabbits into herself and faking their birth. Mary Toft died and was buried in Godalming in 1763. Court testimony of 1764 attests to how purchasing one of the mills in Godalming and dealing in corn and flour brought a substantial income. Godalming came to world attention in September 1881, when it became the first town in the world to have installed a public electricity supply. It was Calder & Barnet who installed a Siemens AC Alternator and dynamo which were powered by a waterwheel, at Westbrook Mill, on the River Wey. There were a number of supply cables, some of which were laid in the gutters, that fed seven arc lights and 34 Swan incandescent lights. Floods in late 1881 caused problems and in the end Calder & Barnet withdrew from the contract. It was taken over by Siemens. Under Siemens the supply system grew and a number of technical problems were solved. But later on in 1884 the whole town reverted to gas lighting as Siemens failed to tender for a contract to light the town. This was due to a survey they undertook in the town that failed to provide adequate support to make the business viable. Siemens had also lost money on the scheme in the early years, but was prepared to stay on in order to gain experience. Electricity returned to the town in 1904. Guildford is 4 mi (6 km) NNE and London is 30.5 mi (49.1 km) northeast of Godalming; the Weald, a remnant forest of small wooded settlements adjoins the town to the southwest and the North Downs Area of Outstanding Natural Beauty is 2.9 mi (4.7 km) north of the town centre. Elevations vary between: 36 m (118 ft) AOD by the Guildford Road Rugby Union ground and Broadwater lake at the River Wey's exit from Godalming into Peasmarsh, Shalford; to 106 m (347.76 ft) AOD where Quarter Mile meets Hambledon Road (both residential) in the south east; similarly Hurtmore Road which is also residential, Upper Green/Hurtmore is at 102 m (334.64 ft) AOD; immediately north and south of the town centre steep hills reach 95 m (311.67 ft) AOD from 40-45m (131.23-147.63 ft) AOD in the town centre itself. In terms of rock and mineral structure, the soil is Gault Clay superimposed by Upper Greensand, Claygate Beds and Bagshot Sands; throughout the narrow east-west middle valley of Godalming and its wide northeast suburbs (Farncombe and Catteshall) the rocky head geological deposit is also found; angular pieces of rock and soil derived locally from the extensive frost-shattering of rocks and the subsequent movement of this material down valley slopes. Soil is mostly, i.e. on the upper slopes of Godalming slightly acid only freely draining sandy soil, whereas in the lower parts mentioned above it is slowly permeable loamy/clayey slightly acid but base-rich soil, which area includes the town centre itself. Surrey County Council, headquartered in Kingston, elected every four years, has two councillors from Godalming. Peter Martin, Deputy Leader of the county council and representative of Godalming South, Milford and Witley lives in Godalming. Godalming Town Council's area has 138 listed buildings, of which 82 are within the town centre itself, and 18 of which are monuments. These include Tudor timber framed buildings, 17th-century brickwork buildings and a wide selection of other buildings. One of its most famous landmarks is 'The Pepperpot' which is Godalming's old town hall. Significant buildings in the town include Edwin Lutyens's Grade II* listed Red House, and an English public school, Charterhouse, which stands 0.7 mi (1.1 km) from the town centre, on the top of Charterhouse Hill, which is half-separated from Frith Hill by a steep ravine. Its main building is Grade II listed and the chapel, built by Sir Giles Gilbert Scott, is Grade II* listed. Winkworth Arboretum, with its collection of rare trees and shrubs, is a few miles to the south. The Parish Church of St Peter and St Paul's, is a Grade I listed building. The 19th century town hall, nicknamed 'the Pepperpot' due to its cupola, is a distinctive octagonal building on the High Street. Its unique design means has become emblematic of the town. Built in 1814, the Town Hall replaced the medieval "Old Market House" that had occupied the site since the early Middle Ages. It was in this Market House (and its predecessors) that the local Hundred Court met and discussed matters of local importance for more than a thousand years. The upstairs rooms continued to be used for civic gatherings until 1908. The Pepperpot later housed the town museum, and continues to be used as a public function room. The arched area beneath the building, at street level, has been used as a marketplace. The successor town hall is called Godalming Borough Hall and has its main frontage on Bridge Street. The radio operator of RMS Titanic, Jack Phillips, was born and lived in Farncombe, worked in Godalming and at sea. He is famed for remaining at his post, sending repeated distress calls, until the ship sank. Phillips is commemorated in a number of ways around the town, including a section of Godalming Museum, a memorial fountain, cloister and garden walk near the church, and a Wetherspoons-chain public house named in his honour. Godalming railway station is on the Portsmouth Direct Line between London Waterloo and Portsmouth, served by South Western Railway. The station has been council-recognised for its floral decorations including 10 hanging baskets. The town is served by a bus network connecting the town centre with the main residential areas. These are provided by Arriva Southern Counties, Stagecoach South and Buses Excetera. A community transport service is provided by "Hoppa". Chaired through its difficult early days by Brian Richards, Waverley Hoppa has burgeoned into a low-price provider of minibus and MPV personalised transport for the elderly, the disabled, the young and others for whom simply getting from where they are to where they want to be is a problem. Godalming lies approximately equidistant, 31 mi (50 km), from Heathrow and Gatwick, the two major commercial international airports in South East England. Fairoaks and Farnborough are the closest airports but no scheduled services are available from either. The Godalming Navigation terminates at the Bridge Road bridge by the United Church. People live in the town centre and adjoining named neighbourhoods included within the Town: east Catteshall; west Aaron's Hill and Ockford Ridge; north: Farncombe, Charterhouse and Frith Hill; south: Holloway Hill, Busbridge and Crownpits. Sometimes Milford is classed as a suburb of Godalming. In general the southern network of roads towards Busbridge and western network of roads towards Hurtmore, by Charterhouse School are the two neighbourhoods with the highest average price of housing in the Godalming area. 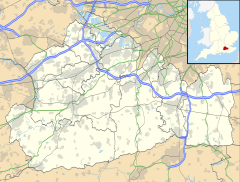 Catteshall (pronounced 'Cat-ah-shull') is the directly attached neighbourhood and commercial estate in the east of Godalming civil parish, formerly a hamlet between the town of Godalming and the villages of Unstead and Thorncombe Street. Catteshall Manor is at the top of the hill and the former Ram Cider House is at the bottom. The cider house is named after a ram pump which pumps water from a natural spring up the hill. The hamlet's name is thought to come from Gattes Hill to derive from "a gate to the hill". Two buildings are listed: Ram Cider House and Catteshall Grange as the manor house is on the higher land which is now in Busbridge Civil Parish. Catteshall is also home to a number of high tech industries, such as Cloud Computing Provider MTI Technology, Business Data Specialists The Content Group, & the new Surrey Data Park, home to Aegis Data Centre. Immediately north of the Lammas lands, Frith Hill is a hillside and hilltop residential neighbourhood that contains seven listed residential buildings. A converted water tower, liked by architectural expert Nicholas Pevsner, two small cemetery chapels, railings and gates form three separate Grade II listings, which are on the town-side hill slope. At a grade higher (Grade II*) compared with all the other listed buildings in Frith Hill, the Red House was built in 1899 by architect Edwin Lutyens, using Flemish bond brickwork, for a retired clergyman and school housemaster for Charterhouse School 0.5 mi (0.80 km) away: "an early seminal work by Lutyens". Binscombe with a small village centre, without a parade of shops, has a neat grid of surrounding housing which is contiguous with Farncombe's on the north side of Godalming. A church is in the centre of the residential area; Binscombe Church, built in 1969. Whilst within the town, the traditional village of Compton is closer than the town centre to most of Binscombe. Charterhouse School is one of the great historic schools of England. It is one of nine prominent schools, which included Eton College and Harrow School, investigated for poor conditions and financial mismanagement under the terms of the Clarendon Commission established in 1861. The subsequent Public Schools Act passed in 1868 gave rise to both the common term of reference as well as an improved governance framework for seven independent schools. The school was originally founded in 1611 and relocated to Godalming in 1872. The impressive school buildings within the 200 acre estate include a chapel designed by Sir Giles Gilbert Scott (designer of the British red telephone box) to which have been added many new sporting and academic facilities. The 6th form is mixed (2:1 boys:girls) and most pupils board. Prior's Field School is an independent girls boarding school founded at the beginning of the 20th century by Julia Huxley. There are 450 pupils of which about a quarter are boarders (weekly or termly). The main entry points to the school are at ages 11, 13 and 16. Its most recent ISI inspection in March 2011 awarded the school the top rating, excellent, in all nine categories including quality of teaching and links with parents. St Hilary's School is an independent preparatory school for boys 2.5 - 7 (around 90) and girls 2.5 - 11 (around 200). Godalming College is in the Holloway Hill area of Godalming. Founded in 1975 on the campus of Godalming Grammar School, it caters for sixteen- to nineteen-year-olds and is state maintained. Awarded Beacon status in 2006, it was the best performing state school for AS/A levels in the Surrey area in 2004; its Ofsted report for 2005 graded the college as "outstanding" in six of the seven key areas and "good" in the 7th. Numbers in brackets indicate the % of pupils achieving 5 A-C GCSEs in total and then including the key subjects of maths and English. Rodborough Technology College is in the village of Milford on the outskirts of Godalming, Rake Lane. It caters for young people from 11 to 16 and has no 6th form. (64, 59). All primary schools in Godalming are coeducational. Infant schools cover the age range 4–7, junior schools cover 8–11. The figures shown in brackets are VA value added a measure of how pupils' performance has improved, and AGG aggregate score the sum of the percentages of pupils achieving the expected levels in English, maths and science (thus the maximum possible is 300). Loseley Fields Primary School (VA 98.9, AGG 195) is in Binscombe, see above. Green Oak C of E Primary School, formerly St Mark's, currently covers just the first two-year groups but will expand by a year group annually, it is in the Ockford Ridge area of Godalming. Busbridge Church is an evangelical Anglican Church in Busbridge on the southern hill of Godalming. Godalming Baptist Church is a Baptist church right at the centre of Godalming. St Peter and St Paul's is the Anglican parish church at the end of Church Street. St Edmund's is the Roman Catholic parish church. The church stands on a "dramatic hillside site" just off Flambard Way close to the centre of the town. Meadrow Unitarian Chapel on the outskirts of the town, in Meadrow. Guildford Hockey Club is based at Broadwater School, and the men's 1XI compete in the England Hockey League. Godalming Band has been active in its current form since 1937, there having been a previous town band established in 1844. The main band and the Youth Band play at a variety of community events and concerts throughout the year, some at the town's bandstand, in aid of the band and other local charities. Godalming Theatre Group is an amateur theatre company in Godalming. It performs three productions a year at the Ben Travers Theatre, Charterhouse School, Godalming: a spring musical, autumn drama or comedy, and a Christmas pantomime or show. It also runs a youth theatre group. The "Denningberg Centre for the Elderly" is named after Danny Denningberg (1923−2011), a local politician who was honoured with the Honorary Freedom of the Borough of Waverley in 2007. Denningberg was a community activist and fund raiser who served as a councillor on Godalming Borough Council in 1954 and then again from 1963 continuously through the formation of Waverley until 2003 when he retired. Denningberg had also been both Mayor of Godalming and Mayor of Waverley during his public career. The "Wilfrid Noyce Community Centre" in Godalming is named after Wilfrid Noyce (1917–1962), a master at Charterhouse and a mountaineer who was on the expedition that made the first ascent of Mount Everest in 1953. The Clockhouse, or Milford and Villages Day Centre, is a day centre for people over 50. The money to build it in 1997 was raised entirely from charitable donations and local fundraising. Godalming is home to The National Autistic Society (NAS) resource centre for the south east and the NAS horizons day centre. The Godalming Town Lottery "GOLO" was launched in Godalming on 1 November 2008, by the Go-Godalming Association, a member of the Lotteries Council. Tickets, sold at local shops and pubs, cost £1 and the draw takes place on the last Saturday of every month. The first one was on Godalming Town Day, 29 November 2008, at the Pepperpot. It is considered to be the first town lottery of its kind. There are 17 prizes, ranging from £500 to £10. Profits are donated to local causes, beginning with the Bandstand roof fund. GOLO is a community lottery for the Godalming Community. The first independent town lottery in the country has now turned three years old. GOLO has given away more than £18,000 to local causes and more than £30,000 in cash prizes. To celebrate, GOLO launched another easy way to buy GOLOs each month—Standing Orders. In a charter dated 7 June 1300, King Edward I granted the Bishop of Salisbury the right to hold a weekly market and an annual fair in the town. Godalming remains a typical English market town, with a market every Friday and a selection of independent and national retailers selling clothing for all ages, shoes, watches, jewellery, fine art, books, gifts, stationery, music, guitars, computers, photography, pine furniture, antiques, flowers, hardware, food of all sorts, and household goods. In addition there are the ubiquitous banks, building societies, estate agents, travel agents, solicitors, cobblers, accountants, employment agencies and charity shops. There are several pubs, restaurants and cafes, occasional visiting French and Italian markets, and an annual Godalming Food Festival. The comic novel The Return of Reginald Perrin, by David Nobbs, contains the following footnote: "Note: It is believed that this book mentions Godalming more than any other book ever written, including A Social, Artistic and Economic History of Godalming by E. Phipps-Blythburgh." The novel was the second in a trilogy, all of which were adapted to become TV series. In the James Bond novel For Your Eyes Only, Godalming is referred to as a venue for retired colonial civil servants with memories of postings to places "that no one at the local golf club would have heard about or would care about". In the novel Dracula, by Bram Stoker, the character of Arthur Holmwood is the heir to, and later the namesake Baron of Godalming. Much of the action in Bulldog Drummond by Sapper takes place in Godalming. The 2016 album Refresh! by Euros Childs features a song entitled "Godalming". Owing to its typically English appearance, attractive shop fronts and streets, the town has often been used as a backdrop for the shooting of films and television programmes. In February 2006, High Street and Church Street, which runs from the Pepperpot to the parish church, were used in the production of The Holiday. We reached the town of Godalming. I had an idea – how I came about it I cannot say – that Godalming was a pleasant and picturesque town; my drive through it effectually got rid of that idea. I saw nothing pleasant or picturesque about it, even allowing for the determined and depressing drizzle that dulled the outlook. Perhaps I saw things crookedy on that day, but to me, certainly, Godalming looked a one-streeted affair of commonplace houses and shops, with not even a feature amongst the lot worth noticing, not even its old market-house. Those born here include: James Oglethorpe (born 1696), founder of the colony of Georgia; Julius Caesar (born 1830), cricketer; Aldous Huxley (born 1894), writer; Nick Clarke (born 1948), radio journalist and presenter; Stephen Milligan (born 1948), journalist and politician; and Mick Mills (born 1949), footballer. The architect Sir Edwin Lutyens began work in 1896 on a house at Munstead Wood, Godalming, for the garden designer Gertrude Jekyll. She died in 1932 and is buried in the churchyard of Busbridge Church, Godalming, next to her brother. In the 19th century, judge James Wilde, 1st Baron Penzance lived at Eashing Park, Godalming. Major Cyril Raikes MC lived here. In the 20th century, George Mallory, who later made a fatal attempt to scale Mount Everest, taught at Charterhouse School, and then lived in the town after marrying Ruth Turner. He died during the 1924 attempt, but Ruth and their three children remained in the area. W. H. C. Romanis (1889-1972) eminent surgeon and medical author. The composer and music critic Peter Warlock (d. 1930) is buried in Godalming. In the late 20th century, actor Terry-Thomas, comedic actor Terry Scott, actor Christopher Timothy and the singer Alvin Stardust resided in the town. The band Genesis was formed in 1967 by Peter Gabriel and Tony Banks while they were pupils at Charterhouse School. Actor Sam Worthington was born in Godalming in 1976, before moving to Australia at a young age. Billy Dainty a British comedian, dancer, physical comedian and pantomime and television star lived in Godalming. He died on November 19, 1986, aged 59, of prostate cancer at his home, Cobblers, in Godalming. Significant people currently living in the town include the actress Rachel Hurd-Wood, Great Britain field hockey player Dan Fox, Scottish international footballer John Hansen, brother of football pundit Alan Hansen, mathematics author Matt Parker, chess grandmaster and author Simon Williams, and sociologist Sara Arber. Architect Elspeth Beard, who lives in the renovated town water tower, was the first English woman to motorcycle around the world. Paul Merrett, a chef who has appeared several times on British TV, was a pupil at Rodborough. JJ Burnel, bass player of The Stranglers, grew up in Godalming. ^ Henry Marshall founded Marshalls Solicitors in 1831. ^ "Custom report - Nomis - Official Labour Market Statistics". Nomisweb.co.uk. Retrieved 23 February 2019. ^ "Godalming Museum - Godalming and Electricity". Godalming Museum, Surrey. Archived from the original on 19 September 2016. Retrieved 19 September 2016. ^ Dyckhoff, Tom (19 September 2009). "Let's move to Godalming, Surrey". The Guardian. London. Archived from the original on 16 April 2015. Retrieved 19 September 2009. ^ "The top 10 property hotspots". This Is Money. London. Archived from the original on 15 April 2015. Retrieved 2 October 2006. ^ Bingham, John (29 March 2013). "Waverley tops list of best places to live". Daily Telegraph. London. Archived from the original on 2 April 2013. Retrieved 29 March 2013. ^ Gore, Alex; Barrow, Becky (29 March 2013). "Looking for the good life?". Daily Mail. London. Archived from the original on 4 May 2013. Retrieved 29 March 2013. ^ "The 22 happiest, richest, healthiest, and most crime-free areas in Britain". The Independent. London. 13 October 2016. Archived from the original on 26 August 2017. ^ St Peter and St Paul's Church - Grade I listing: Historic England. "Details from listed building database (1044546)". National Heritage List for England. Retrieved 5 November 2012. ^ "Domesday Book entries from Surrey from an individual historian". Archived from the original on 30 October 2007. ^ Powell-Smith, Anna. "Godalming - Domesday Book". Archived from the original on 11 April 2013. ^ "Ordinary of Newgate's Account, 7 March 1764". Archived from the original on 4 December 2014. ^ a b c d "UK Grid Reference Finder". Archived from the original on 22 November 2012. ^ "Soilscapes soil types viewer - National Soil Resources Institute. Cranfield University". Archived from the original on 2 June 2013. ^ a b "Surrey's County councillors". Surrey County Council. 3 February 2012. Archived from the original on 10 October 2011. Retrieved 2 March 2012. ^ "Election Maps". Archived from the original on 20 February 2016. ^ Historic England. "The Red House (1044519)". National Heritage List for England. Retrieved 2 February 2019. ^ Historic England. "Charterhouse School (main building) (1190288)". National Heritage List for England. Retrieved 2 February 2019. ^ Historic England. "Chapel at Charterhouse School (1352726)". National Heritage List for England. Retrieved 2 February 2019. ^ McDonald, Jacqui. "Hiring Godalming Borough Hall". Waverley.gov.uk. Archived from the original on 24 September 2017. Retrieved 7 May 2018. ^ "South West Trains". Southwesttrains.co.uk. Archived from the original on 6 February 2007. Retrieved 7 May 2018. ^ "Godalming United Church". Archived from the original on 8 December 2010. ^ Historic England. "Details from listed building database (1044519)". National Heritage List for England. Retrieved 5 November 2012. ^ The English House 1860-1914 (The Flowering of English Domestic Architecture) 1986, Gavin Stamp, pp 100-101. ^ "Charterhouse School's History". Archived from the original on 2 January 2007. ^ "Charterhouse School website". Archived from the original on 5 January 2007. ^ "Priorsfield - independent private girls boarding school in Surrey, England, UK". Web.archive.org. 21 December 2002. Retrieved 23 February 2019. ^ "Prior's Field School :: Independent Schools Inspectorate". Archived from the original on 28 September 2013. ^ "Home - St Hilary's School". Archived from the original on 9 February 2007. ^ "Godalming College". Archived from the original on 9 October 2006. ^ "2006 GCSE and A-level results: Surrey". The Guardian. London. Archived from the original on 24 May 2011. Retrieved 3 May 2010. ^ "BBC News, School league tables 2004, Surrey LEA". BBC News. Retrieved 3 May 2010. ^ "Welcome to Godalming Junior School". Archived from the original on 28 September 2007. ^ "The School". Web.archive.org. 16 September 2007. Retrieved 23 February 2019. ^ "Welcome to Moss Lane School". Archived from the original on 10 February 2007. ^ "200 invalid-request". Stedmundsschool.co.uk. Archived from the original on 5 May 2011. Retrieved 7 May 2018. ^ Administrator, getsurrey (11 September 2008). "Green Oak puts down new roots". Archived from the original on 4 October 2011. ^ "Witley CofE Infant School". Archived from the original on 9 February 2007. ^ Historic England. "Church of St Edmund King and Martyr, Croft Road (south side), Godalming (Grade II) (1189582)". National Heritage List for England. Retrieved 5 October 2015. ^ "Listed Buildings". English Heritage. 2012. Archived from the original on 24 January 2013. Retrieved 1 November 2015. ^ Historic England. "Unitarian Chapel and Cottage, Meadrow (east side), Godalming (Grade II) (1044505)". National Heritage List for England. Retrieved 5 October 2015. ^ Historic England. "Former Congregational Church and attached Sunday School, now Messenger, May & Baverstock Premises, Bridge Street (north-west side), Godalming (Grade II) (1294577)". National Heritage List for England. Retrieved 5 October 2015. ^ Historic England. "Salvation Army Meeting Hall, 18 Mint Street (north side), Godalming (Grade II) (1044475)". National Heritage List for England. Retrieved 5 October 2015. ^ Busbridge Church Archived 1 August 2012 at the Wayback Machine, Busbridge Church website. ^ Godalming Baptist Church Archived 6 April 2012 at the Wayback Machine, Godalming Baptist Church website. ^ Parish of Godalming Archived 26 April 2013 at the Wayback Machine, Parish of Godalming website. ^ Sladen, Teresa; Antram, Nicholas (11 November 2005). Architectural and Historic Review of Churches in the Roman Catholic Diocese of Arundel and Brighton (PDF) (Report). English Heritage. Archived (PDF) from the original on 4 October 2015. Retrieved 1 November 2015. ^ Stell, Christopher (2002). Nonconformist Chapels and Meeting-houses in Eastern England. Swindon: English Heritage. ISBN 1-873592-50-7. ^ "Guildford Hockey Club". Archived from the original on 13 April 2012. Retrieved 16 March 2013. ^ "Godalming Band - Welcome". Archived from the original on 17 March 2015. ^ "GTG". Archived from the original on 16 April 2007. ^ Administrator, getsurrey (18 October 2007). "Former mayor awarded freedom of town after 'worst year of his life'". Archived from the original on 5 April 2012. ^ "GOLO The Godalming Lottery - Raising money for good causes - Godalming Farncombe Milford". Archived from the original on 28 February 2009. ^ Hissey, James John (1913). A leisurely tour in England. London: Macmillan. p. 83. ^ "www.School-Portal.co.uk **". Archived from the original on 27 September 2007. Wikimedia Commons has media related to Godalming.